In a rare, back-to-back performance, retail sales in the US fell for the second month after a downward revision put December sales into the red. In a blame the weather tactic Reuters reports Retail Demand a Bit Cooler. While the two straight months of declining sales most likely reflected frigid temperatures, there were also signs of general weakness creeping in as online sales also fell. Stripping out automobiles, gasoline, building materials and food services, so-called core sales fell 0.3 percent. Core sales for December were revised to only a 0.3 percent rise from a previously reported 0.7 percent advance. November's core sales figure was also revised down. Core sales correspond most closely with the consumer spending component of gross domestic product. The downward revisions to November and December core sales suggest that fourth-quarter consumer spending and economic growth were not as strong as initially thought. Sales at U.S. retailers declined in January by the most since June 2012 amid bad weather and uneven progress in the labor market, signaling the economy was off to a slow start in 2014. The 0.4 percent decrease followed a revised 0.1 percent drop in December that was previously reported as an increase, according to Commerce Department figures released today in Washington. The median forecast in a Bloomberg survey of economists called for no change. Jobless claims unexpectedly climbed last week, other data showed. After the drop in retail sales, Goldman Sachs cut its tracking estimate for first-quarter growth to 1.9 percent from 2.3 percent, Credit Suisse lowered to 1.6 percent from 2.6 percent, and Morgan Stanley reduced its projection to 0.9 percent from 1.9 percent. Here are a couple of Retail Sales charts from the census department. The U.S. Census Bureau announced today that advance estimates of U.S. retail and food services sales for January, adjusted for seasonal variation and holiday and trading-day differ ences, but not for price changes, were $427. 8 billion, a decrease of 0.4 percent (± 0.5%)* from the previous month, but 2.6 percent (±0. 9%) above January 2013. Total sales for the November 2013 through January 2014 period were up 3.4 percent (±0.5%) from the same period a year ago. The November to December 2013 percent change was revised from +0.2 percent (± 0.5%)* to -0.1 percent (±0.3%)*. This month the major increase was gasoline sales. Is that a good thing? 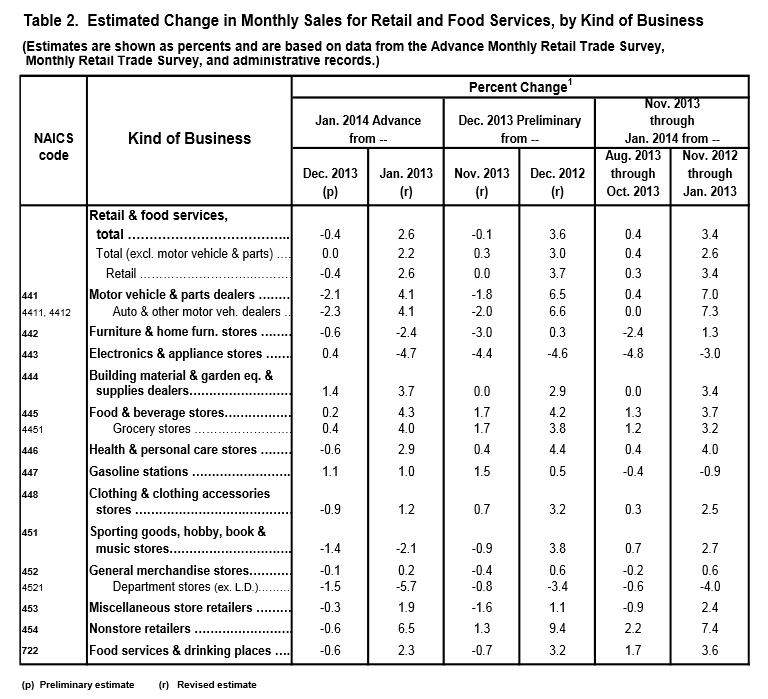 More importantly, note that general merchandise sales are barely up year-over-year. Auto sales and parts is what fueled the overall year-over-year advance. How long can that last?